viaLibri ~ THE CHRONICLES OF CRIME; OR, THE NEW NEWGATE CALENDAR. BEING A SERIES OF MEMOIRS AND ANECDOTES OF NOTORIOUS CHARACTERS WHO HAVE OUTRAGED THE LAWS OF GREAT BRITAIN FROM THE EARLIEST PERIOD TO 1841 . THE CHRONICLES OF CRIME; OR, THE NEW NEWGATE CALENDAR. BEING A SERIES OF MEMOIRS AND ANECDOTES OF NOTORIOUS CHARACTERS WHO HAVE OUTRAGED THE LAWS OF GREAT BRITAIN FROM THE EARLIEST PERIOD TO 1841 . Reeves and Turner, London 1886 - Two volumes. xii,592;viii,636pp. Thick octavo. Slightly later 3/4 red morocco and cloth, t.e.g., for Putnam. Engraved frontispieces, extra-titles, plates and illustrations. Spines rubbed and a bit darkened, with cracks at toes of lower joints, foretips a bit worn. A sound set. 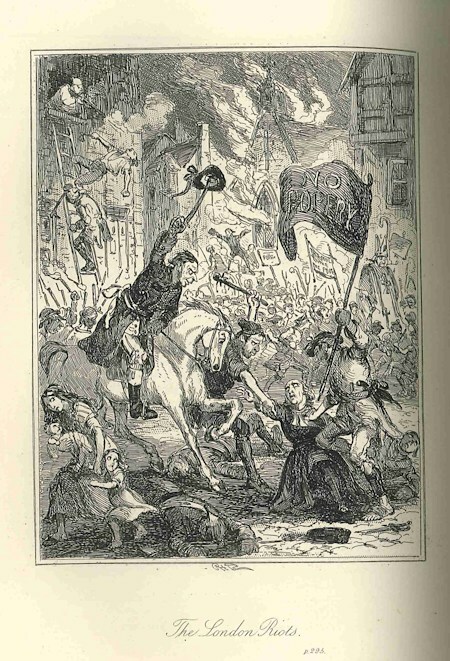 A faithful reprinting of the 1841 original, including an array of steel engravings by "Phiz" (Hablot Knight Browne). Pelham's gallery includes accounts of "Coiners, Extortioners, Forgers, Fraudulent Bankrupts, Footpads, Highwaymen, Housebreakers, Incendiaries, Impostors, Murderers, Mutineers, Money-Droppers, Pirates, Pickpockets, Rioters, Sharpers, Traitors, &c., &c," but seems a bit light on bumming- lays.